Special Containment Procedures: SCP-1914-J is to be held in Containment Locker 37 at Site-19. Access may be granted by the current Site Director. 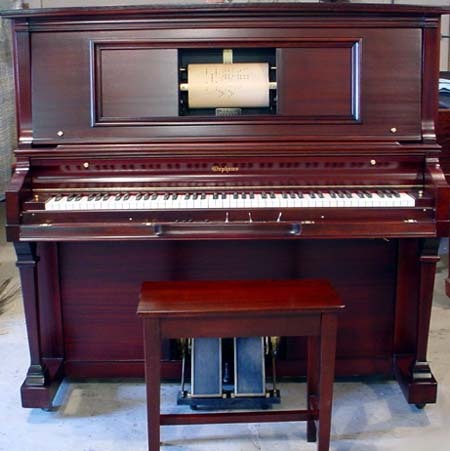 Description: SCP-1914-J is a Welte brand Reproduction style player piano. 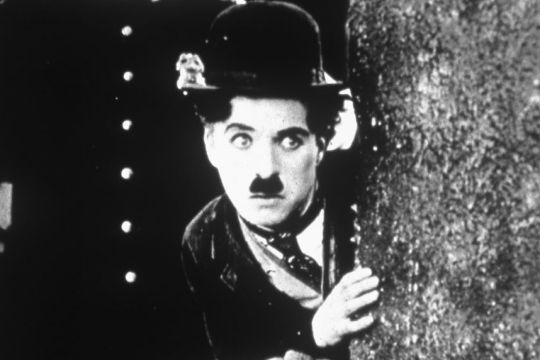 When SCP-1914-J is activated, it produces an environment reminiscent of early silent films. These effects spread to a maximum radius of 980 meters, however the range of the effect may be controlled by SCP-1914-J's volume dial. This effect will cease once SCP-1914-J's music sheet ends. This music sheet is interchangeable with other compatible ones, and the effect may be extended to up to two hours. The music SCP-1914-J creates is broadcast throughout the area of effect. No other sound besides this can be produced within the radius. All surfaces within SCP-1914-J's area of effect lose all color, retaining shades of grey. The architecture of buildings may become more exaggerative (e.g. large buildings may gain decorative figures and become taller, small houses may become villas or cottages). Modern technology will be transformed into early age counterparts, or, if the item did not exist around the 1920s era, it will be transformed into a fantastic or impossible object (Dr. ██████████'s personal laptop changed into a large metal mechanism with hydraulic arms labelled "Dr. ██████████'s Calculation Machine". The object made several motions however the output was indecipherable). Advertisements and decorative features will change to become era appropriate. Subjects gain clothing expressive of their occupation or situation. Subjects also tend to show much more exaggerative expressions and actions, as well as a larger tendency to be mischievous or aggressive. Probability manipulation also appears to take place; objects such as vaults or pianos will generally fall from ropes or windowsills, in spite of no plans for said objects to be moved. While subjects tend to be caught in such accidents, no recorded instances of subjects dying from accidents have been recorded. However, ~23% of subjects require medical care, and show a tendency to obtain obtrusive casts or bandages in several areas of the body, even when obtaining care outside of the area of effect. Dr. ██████████ hiding from hostile subjects. Objects or subjects removed from the area of effect retain their lack of colouration and are unable to produce sound. However, subjects will actively resist being removed from the radius. These effects do not take place if the radius shrinks due to a change in SCP-1914-J's "volume", or when SCP-1914-J finishes its music sheet. Over time subjects will accidentally wrong one another, causing mischievous or malicious acts in response. Although initially this may simply be "slapstick" violence, lethal acts such as dropping a large weight on the subject or forcing the subject into a vehicle and driving off a cliff will occur following prolonged exposure. Agent ████████ during incident 1914-J-5. Description: During an attempted attack on Site-19 by Chaos Insurgency operatives, SCP-1914-J was accidentally activated during a retreat into the containment locker area. Site-19 was encapsulated by SCP-1914-J's area of effect. Security staff immediately gained the uniform of an English "bobby", and were armed with nightsticks and small Glocks. Conversely, Chaos Insurgency operatives were dressed as traditional cat burglars, with assorted handguns. The two parties engaged each other approximately 10 minutes after SCP-1914-J's activation. Instead of usual tactics, both parties engaged in direct one-on-one combat. SCP-1914-J appeared to have an effect on the engagement. Some examples of SCP-1914-J assisted maneuvers include: Security Head ██████████ making an operative follow his hand movements before poking the operative in both eyes, Agent █████ ramming an operative onto the ground, where the operative got his head stuck in a paint can, and Agent ██████████████ shaking a champagne bottle and hitting an operative with the cork. Unfortunately, Agent ████████ suffered several broken limbs following an operative "accidentally" hitting Agent ████████ with a jalopy. Aside from Agent ████████ being sent to Site Medical, no other casualties were sustained.